A Jewish man was walking down a road. He was robbed, beaten up and left for dead. Three men walked down the same road. All three saw the man lying there. Two of them — the priest and the Levite — crossed to the other side and walked on. The third man — a Samaritan — stopped to help. 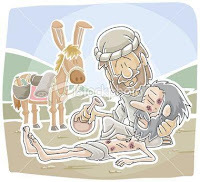 The Samaritan (someone who was hated by the Jews) could have walked on, and nobody would fault him for that. But he had compassion for th e man. He cleaned and bandaged his wounds. 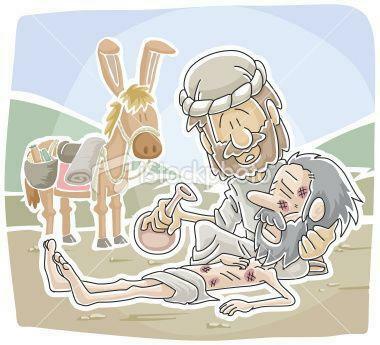 Put him on his donkey and paid for his care at the inn. More than pity or sympathy. Compassion is understanding how the other person feels and doing something about it. It sometimes requires going out of our comfort zone — sacrifices, inconveniences, time, money. Doing good and kind things is right and good. But if we do it by ourselves, by our own strength and wisdom, we can end up burnt out or disillusioned. Illustration: Cup of water - If we just give whatever we have, we end up empty and dry. But if we are connected to an eternal source of water (waterfall, hose attached to tap), we will never run dry. And God showed us compassion when He sent us Jesus. Jesus saw the people as lost and helpless — like sheep without a shepherd. 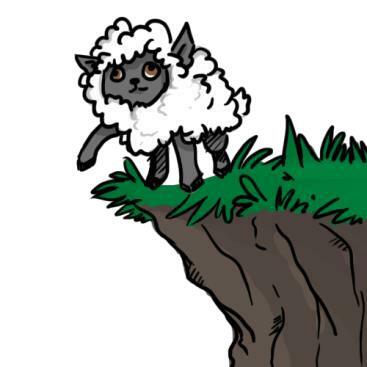 We have learnt about sheep many times — they are defenseless and sometimes dumb, vulnerable to attacks, and get lost easily. That’s why they need a shepherd to guide and protect them. When we see people the way Jesus sees them — that annoying friend, or that rude stranger, or the person you can’t stand — we will be filled with Jesus’ compassion for them. Do you know: we were like this man — attacked by robbers (the devil is the thief); stripped, beaten, left half dead in our sin, helpless and hopeless. He had compassion for us. He cleaned us with His blood. He bandaged us up. He lifted us and took care of us. He paid the price of our sins for us. Do a game/activity to help kids memorize the verse. In smaller groups, get the kids to share who they find it hard to show compassion to and ask Jesus to help them to see them the way He sees them, and show them His love.